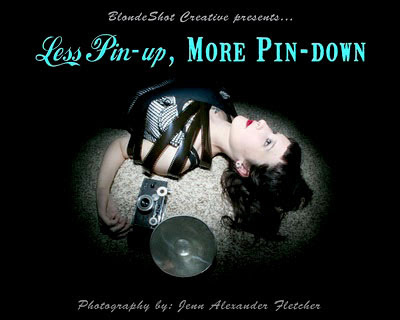 *About the book: Less Pin-up, More Pin-down is a collection of 34 photographs, two of which were previously unreleased. The series is part continuation and part rebellion against the artist’s series Alexander Girls, which was exhibited in Savannah, GA in 2005. Less Pin-up, More Pin-down includes images of 11 different women, including the artist herself. The women are shown under the spotlight, and “pinned down” for a colorful interpretation of hidden personality traits and lifestyle secrets. They are examined as specimens through dramatic and unconventional photographic techniques. The images in this series were taken between January 2009 and April 2010. Book released August 2010. Book specs: Softcover or limited edition hardcover, landscape 10X8”, 50 pages. * Books are now on sale for 50% OFF the original price (orig. $34, now $17)! We only have TWO copies left, and once they are gone, they are gone as this book is now out of print! Shipping rate is for ground shipment to anywhere in the U.S. International orders please email me for rates. Want your copy hand signed?